It's amazing how easy it is for rich tycoons to get people to degrade themselves for a prodigious sum of cash. You'd think that I'm talking about the plot of Rat Race, but I'm really not. This film actually boasts a group of actors who have collectively won three Academy Awards, three Golden Globes, three Screen Actors Guild Awards and four British Academy of Film and Television Awards. Unfortunately, all this talent is wasted on a film that goes for simple, crude laughs. Donald Sinclair (John Cleese) is a guy with gobs of money, and really big, white, distracting teeth. He owns a casino in Las Vegas, and his high-rolling friends like to make wagers that are out of the ordinary. So he arranges a contest where six different keys to a locker in Silver City, New Mexico are distributed, and the first person or duo to "race" the 500 miles from Vegas to the locker gets the $2 million that is inside of it. Sinclair's gambling buddies choose which one the six key-holders will win, unbeknownst to the participants in the race, of course. Enter our core group of actors, who receive varied amounts of attention throughout the course of the film. Breckin Meyer plays Nick, a Chicago attorney who is in Vegas for a bachelor party, and whose political and career aspirations keep him extremely conscious about committing any sorts of unseemly acts. He initially decides against participating in the race, but once he meets an attractive pilot named Tracy (Amy Smart), he decides to go for it. Their storyline is the least interesting, and one episode involving Tracy's boyfriend happens to be downright painful to watch. Fortunately, the pair doesn't see much screen time beyond that particular scene. Vera Baker (Whoopi Goldberg) is meeting her long-lost daughter for the first time in 21 years. Merrill (Lanei Chapman) owns her own cosmetics company, but it is intimated that she may be having some financial difficulty, and after some initial hesitation, the duo decides to go for the money. If you're bothered by politically-incorrect comedy, this pair has a scene that is bound to offend. Nonetheless, I found Goldberg to be much less irritating than I usually do, perhaps because her story is another one that doesn't receive a great deal of focus. 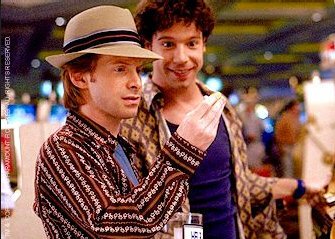 Substantially more attention is given to Seth Green and Vince Vieluf, who play Duane and Blaine, brothers and bumbling con men. In a joke that is carried way too far, Blaine is completely impossible to understand because he has pierced his own tongue. Still, I'm embarrassed to say I found myself laughing much of the time when this duo was onscreen. They did have nice chemistry and worked well together. On the flip side, I found Jon Lovitz' storyline to be painfully unfunny. Lovitz plays Randy Pear, a Home Depot worker who is vacationing in Vegas with his wife (Kathy Najimy) and children. It may have only felt like it because the gags were so awful, but this bunch seemed to get the lion's share of time on the screen. Cuba Gooding, Jr. plays Owen, a referee who everybody in Vegas recognizes because he's the guy who blew a call horrifically in the previous week's Cowboys game. It seems that people who gamble on football games get a little cranky when they lose money. I'm really not certain where the clause is that disallows Gooding from ever getting a decent part again since his Academy Award win, and that trend certainly continues here. He gets to flail his arms around and act overemotional, but it's never really amusing. The final contestant is Enrico Pollini, played by Rowan Atkinson. Pollini is a narcoleptic Italian visiting Vegas for the first time. Other than one extremely uncomfortable bit as the film's climax approaches, Atkinson is hilarious and is the highlight of the movie. His gift for physical comedy is showcased, albeit rather briefly for the most part. Several other actors are featured in brief appearances, and if there wasn't already an abundance of characters to keep straight, these cameos might have been a fun aspect of the film. Although I found that the majority of the jokes fell flat, Rat Race never drags or hits any slow spots. The pacing is almost perfect, and the movie really feels much shorter than its nearly two-hour length would indicate. Unfortunately, that frenetic energy only leads to a finale that is a complete letdown. Since the film seemed to be targeted to a more mature audience, I was hoping Rat Race might showcase more smart humor and less of the gross-out stuff that seems to saturate even the best comedies from this year. Unfortunately, my disappointment can only allow me to say that it's a bad, bad, bad, bad movie.